Grab this Ultra-High Quality Pull Up Bar and create a complete work out area without using valuable floor space. Great in a gym, studio, garage, sports facility, or physical therapy clinic. Commercial quality and built to last. Mounting holes are 24-inches on center to naturally hit wood studs. A usage video can be seen on our www.theanchorgym.com website. Comes with all mounting hardware and installation instructions. 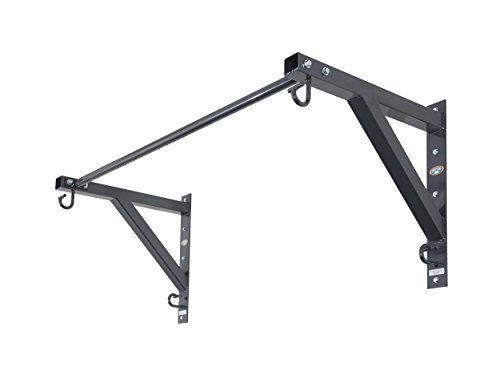 24" of wall clearance; Commercial grade 1-1/4" Solid Steel Bar; Highest quality PUB station on the market! Our unique pull up bar multi-station features 4 Anchor Gym Patented Hooks that fastens all brands of resistance bands, suspension straps, yoga stretch straps and other popular accessories. No clip hooks required! Supports dual user simultaneous training. Rated up to 350 lbs! Perform hundreds of exercises with the most popular accessories on the market today! If you have any questions about this product by Anchor Gym, contact us by completing and submitting the form below. If you are looking for a specif part number, please include it with your message.